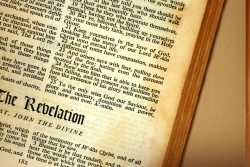 What can we learn from the opening and closing of the book of Revelation? [audio:http://www.truthrevolution.tv/show/TS-0244.mp3]No Flash Support? Use this Audio Player! Dave: When will the book of Revelation occur? Jeff: Well, let’s look to the book itself! Dave: The opening of a book is the most important paragraph and sentence. Jeff: It sets the expectations for the rest of the information provided. So, let’s examine closely the very first sentence in the book of Revelation. Dave: SOON? The first verse says it will happen SOON! Jeff: What is the plain meaning of these verses? That the book of Revelation would mostly be fulfilled very near to the time of its writing. Dave: And the book was written around 60 AD. Jeff: Interesting that most of the prophecies were also fulfilled around 70 AD.